I was given a great birthday present... it wasn't anything material, it wasn't anything bought. I was given the gift of being able to see my dad and grandma a few days before my birthday. Being about fourteen hours away from my family it is really hard not being able to spend my birthday with them. 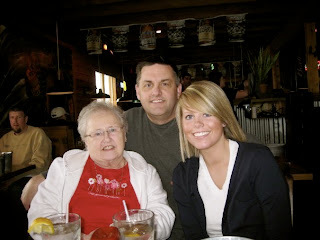 But this year I got to spend a couple of hours with my dad and grandma. Because they love me so much, they took the long route home back to Seattle from Salt Lake. On Sunday I met up with them in Idaho Falls and we went out to dinner at Texas Roadhouse. I love you two so much for stopping and seeing me! I wish the whole family could have been there, but I'm just grateful to have had the opportunity to see my dad and grandma!